Nuremberg: The Ups and Downs | What an Amazing World! The distinct melodious southern German accent from the automatic announcer in the tram signaled my destination, the Nuremberg (German: Nürnberg) central train station which is located in a beautiful Neo-Baroque building and facing the Altstadt (old city). Right across the station lies the Königstor (King’s Gate), the main access to the walled old part of Nuremberg. As I walked through Königstraße – the main street leading to the center of the Altstadt – the view of the wide expanse of the city outside the wall turned into a medieval-looking promenade of cobblestone street lined up with tall buildings in authentic German architecture on both sides. I was walking toward Nuremberg Castle, located at the north end of the Altstadt. Despite the numerous small alleys in the Altstadt, the castle is easily accessible from Königstor. One can walk Königstraße until it ends at the Hauptmarkt – the Central Market which is located at an open space right in front of Frauenkirche. Then head further north until the castle is visible. When I was around the Hauptmarkt, there was a particular shop that drew my attention: a Lebkuchen shop. Lebkuchen is a traditional German cookie originated from Nuremberg and usually eaten as a Christmas treat. Made from honey, ginger, cardamom, coriander, cloves, aniseed, allspice and various kinds of nuts, it is hard not to love this cookie. “Well, but here I am now, in summer,” I replied and smiled at him. Then he continued walking, still with a big grin. Currently Nuremberg is Germany’s fourteenth largest city. However, in the past it played a significant role in the history of the nation. During the age of the Holy Roman Empire, Nuremberg Castle was once the place where the Reichstag and courts met. Therefore Nuremberg is often referred as the unofficial capital of the empire. 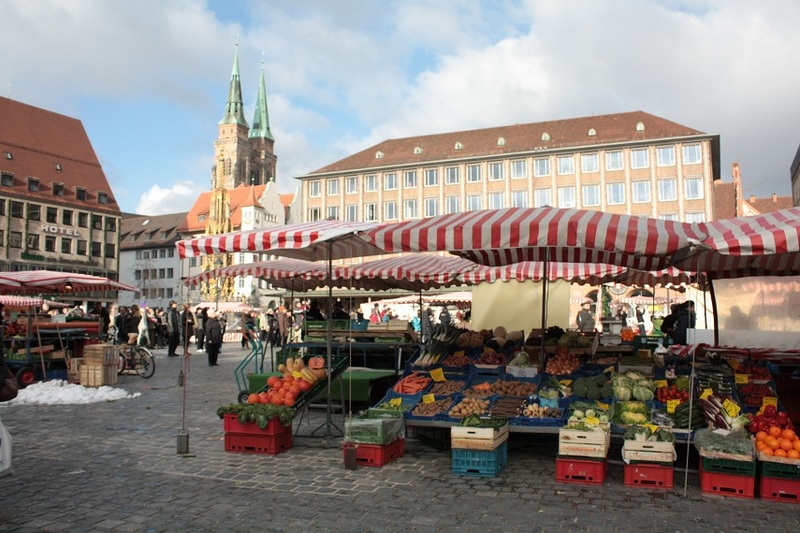 Over time, Nuremberg grew as not only a place to convene but also an important trade center, especially on the route from Italy to Northern Europe. On top of everything, in the 14th century under the edict of King Charles IV, Nuremberg was designated as the city where newly-elected kings of Germany must hold their first Reichstag. 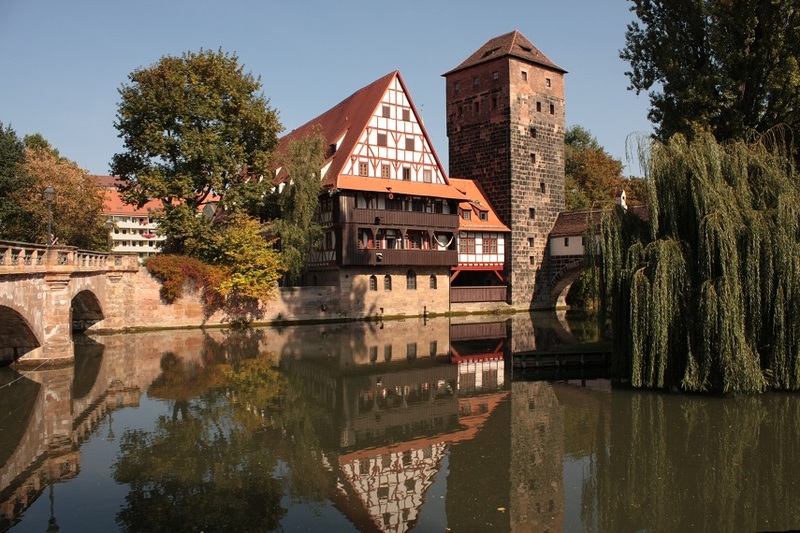 Not only an exceptional city, Nuremberg was also the home to some notable people in history. The most famous native to the city is Albrecht Dürer, the first person to produce the printed map of stars – a map he created himself. Not long afterward, he published the first perspective drawing of the terrestrial globe. It was also in Nuremberg where the main part of Nicolaus Copernicus’ work was published. However, Nuremberg has its own dark chapter in history. Due to its importance in the Holy Roman Empire and geographical location at heart of Germany, the Nazi chose the city to hold huge Nazi conventions – also called the Nuremberg rallies. 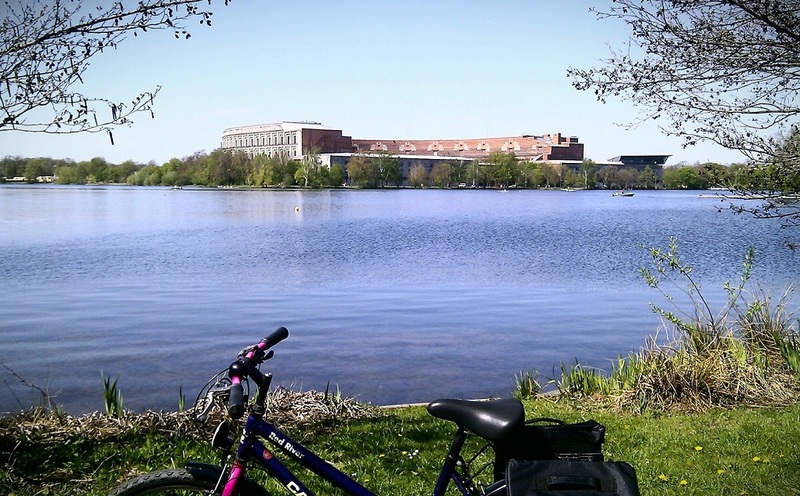 To the southeast of the Altstadt, the Nazi constructed a massive rally ground with huge artificial lakes and a colossal Kongresshalle – slated to be the congress hall for the Nazi. However, this immense building was never completed. Empty spaces inside this building created a very strange and eerie atmosphere for me. On January 2, 1945, Nuremberg was decimated by the bombardments of the Allied forces in a successful attempt to weaken the Nazi. Within only one hour, ninety percent of the medieval city center was destroyed and 1,800 people were killed. When the war has ended, the old city part was rebuilt and carefully restored to its pre-war appearance. Any visitor visiting Nuremberg without learning about its history beforehand, like I did, would never think that this city was once severely damaged during the war. 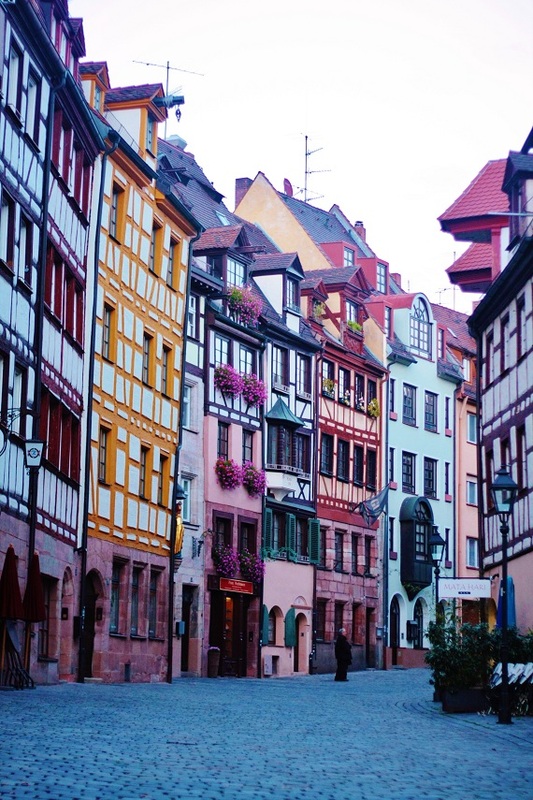 What people can see now is a beautiful and atmospheric Altstadt at the heart of Nuremberg. All photos courtesy of my cousin-in-law, Anne. Nuremberg was my base to explore other German cities back in 2007. Did you go to Dutzendteich? It was such a bizarre place because it felt more like a temple than a congress hall. Yes I did, can you imagine what it would have been like inside if completed? Yeah! In fact the architect was inspired by Colosseum. So it would have been a gargantuan building. Then there was the foundation stone for the Deutsche Stadion…..now that would have been truly colossal! True! It would have been probably the biggest structure built in the 20th century. Love your first photo. Nuremberg is a nice city to visit. I would eat Lebkuchen any time of the year…it is one of my favorite cookies. Thanks Karen! It was my cousin-in-law who took the pictures as my memory card was already full at that time. As with Lebkuchen, it is also one of my favorite cookies ever! 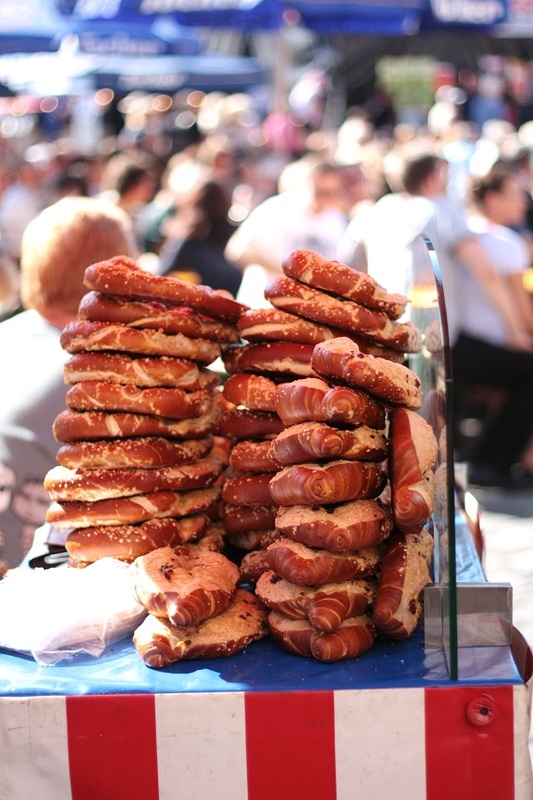 This post had me wishing I stayed longer in Germany when I went last year – I saw Bavaria from across the Danube, but never managed to visit! It happens that my cousin has been living there for more than ten years. So, it was natural for me to make Nuremberg as a base to explore other parts of Bavaria (and Vienna as well). You should go there James! Bavaria is such an interesting place! 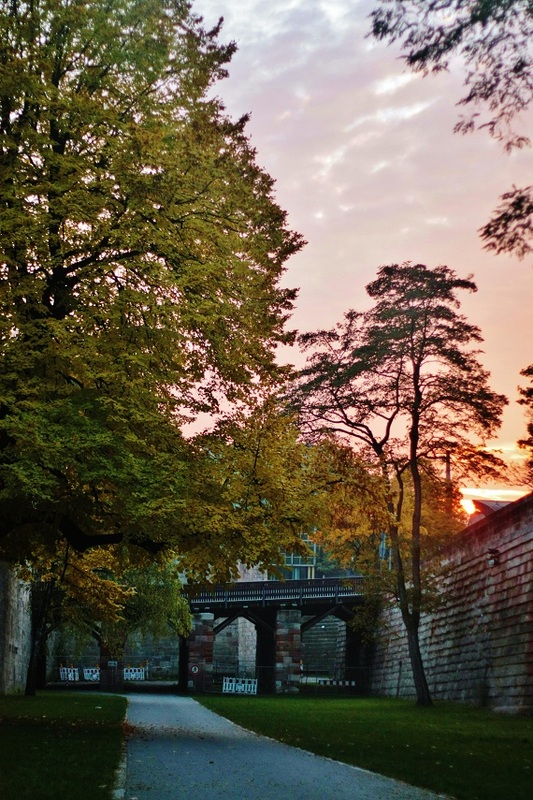 Nuremburg looks beautiful! You were obviousl meant to eat the Lebkuchen too, otherwise why would they be selling them in the middle of summer?! Some time ago I was watching a movie about Nuremberg trials. The wife of an American soldier asked somebody what “that smell” was. The other replied that there were still 30,000 bodies under the ruins (it was destruction all around). Thank you for sharing your visit to the city and knowledge about its history. Oh my goodness.. That is surely a very dark page in mankind’s history. However, do we human ever learn? Wars still engulf some parts of the world up to this moment. However, I believe traveling is one of the easiest ways for us to get to know each other and learn that we actually have more in common. Thanks for sharing the story! A wonderful account Bama, accompanied by great images as usual. Made me realise there is so much of Europe I have yet to see! Thanks Madhu! Nuremberg is by far one of the cities in Europe that left the deepest impression to me. “How” did you end up in Germany… I think I must have missed something (and still can’t figure it out). Great post ! Hahaha, sorry to confuse you. This story was from my trip back in 2007. As I looked back apparently there are some stories worth telling. A trip back in time is always good ! True! I have tons of stories from my travel to Europe back in 2007 but have yet to be published in this blog. Thanks for dropping by! HI Bama, I know about Nuremberg but haven’t been there. I know about its grim Nazi past but didn’t realize it’s a very charming town today. I enjoyed the photos, I particularly love the shots of the hospital, the colorful shops and the pretzels (made me hungry!). Oh my beautiful Germany! There are so many beautiful places to visit. Great job! I love Germany! I have two cousins living there, one in Nuremberg the other one in Düsseldorf. I would love to come back in a heartbeat! Thanks Thorsten! Btw in which part of Germany do you live in? Germany in on my list but having to travel all the way from the Philippines, I feel like it’s not gonna happen really soon. We were in Nuremburg during a train layover and really didn’t have enough time to wander out much. (ie. 1.5 hrs.) But much to my shock while waiting for my German-speaking partner to negotiate the train tickets, I met a German engineer from a construction engineering project that he and I were on in suburbs of Vancouver,BC. He was commuting homeward from Wiesbaden, head office of the German firm that he worked for (and I did for a short time in Vancouver). Very freaky, but a welcome meeting. Such things do happen. But that makes traveling much more interesting, doesn’t it? Hi, Bama.. Nice to read your story. Beautiful English, perfect! In 2010 I were in Frankfurt only about 2 weeks, sor a short course. A lot of class to attend, lack of free time to explore Germany. So, it’s nice to read your story about Germany. and by the way are you a backpacker or something like that? I mean, are you travel a lot because you own a scholarship, or … how ? Hi Bama, thank you for your story on Nuremberg. I went to this city in 1983, with my uncle and a German friend. My uncle used to live in Germany and I visited him there. My impressions on Germany are very similar to yours. 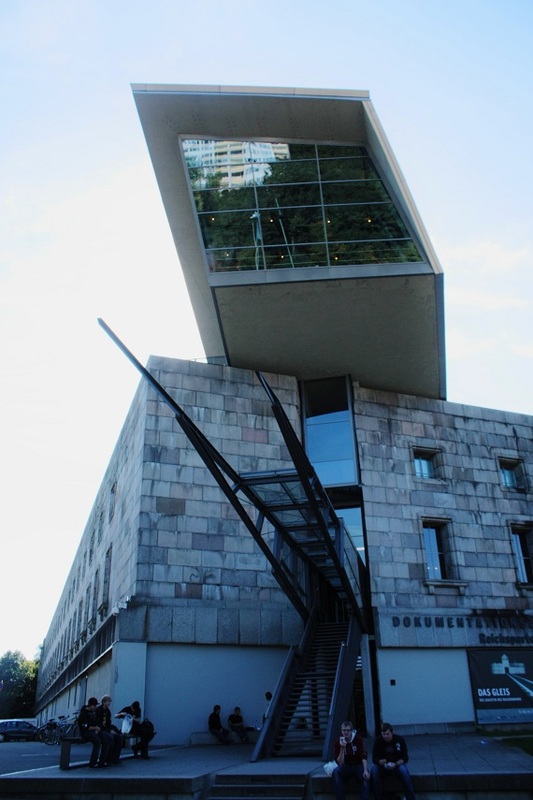 I particularly remember the house of Dürer and his story as an artist. Later I had the opportunity to return four other times to Germany in the years 1985, 2003, 2005 and 2006. In these trips I met with friends and travelled to may places in this country. I hope to return one day. Nuremberg is such a nice city as it is not too big nor too small. But beyond it I found Germany in general very pleasant – I would go back in a heartbeat! Reblogged this on Aktiv i bobil. Hallo there! greetings from Germany! We went to Nürnberg ( that’s what we call in German) last December, it was wet though hehe but we found Nürnberg a very interesting city. We like travelling too!. By the way, saya asli Surabaya tapi tinggal di Jerman. Halo Lulu, salam kenal. I spent almost two weeks exploring Nuremberg and I really fell in love with the city. It’s where I picked up most of the German words I know. 🙂 I have yet to visit the city in winter though — people say the Christmas market is quite interesting. Danke Michelle! I absolutely loved my time in Nuremberg and can’t wait to go back one day! How cool, I was actually raised in Nuremberg and have been missing it ever since I moved to another German city!